Landscape Photographer of the Year's loss is our gain this week where we're featuring Nigel Morton's images including a few classics that failed to get through the first round of Take a View. Well as with most people there have been a few. There are a couple of fairly recent ones which are quite important to me. The first is the realisation I could still create the sort of images I want to make despite living in central London and not having enough time to dedicate to photography. I had grown tired of travelling across the UK to honey-pot locations. I think most photographers go through a phase when they start out, where they visit well know locations and you can’t help but be influenced by images you’ve already seen from those places. I’ve been concentrating of a few spots fairly local to me, most notably Epping Forest, which is around twelve miles from central London. It took me a few months before I started to get a good feel for the area and start creating images I was happy with, but it’s been so much more rewarding in the long run. The old mantra ‘get out more and take less pictures’ is sound advice, which for me could only be achievable with local projects. The second is sort of the opposite of what other people have said in the past regarding making the transition to ‘pro DSLRs’ or large format. For the most part I’m still using the entry-level camera I was using four years ago (a Canon 450d, although I’ve used others). Another reason the Epping Forest project was started was because I really wanted to improve my woodland photography. Now I hope to make it into a book, but really I’m continuing the project because I enjoy it, not because I want to sell large prints or go pro. I do meet people who try and tell me my kit is inadequate, but you know what, it hasn’t stopped me from making work that I’m very happy with, so for now I’ll just carry on with what I’ve got. The last couple of years have been tough financially for my family and I, and I’m in no position to upgrade anyway. As long as I’m happy with the pictures I’m making, that’s all that matters. I started of training as a toolmaker at an engineering firm. Then I took those skills and worked at an R&D lab inside a University. Being around post-grad students inspired me to go and study Engineering at degree level. I loved the design-oriented subjects, but struggled with the maths. I somehow got through and ended up with a Masters in Design and Engineering. This coincided with getting married and becoming a Father for the first time. A close friend mentioned that there were some freelance shifts available on The Times picture desk. Six years later I’m still there. I’m picture editor of the website. I also have ongoing design work (web and print) for my wife’s business, which is finally becoming quite successful and often sees me working around the clock. I may one day end up doing that full-time or going back into engineering. It’s nice to have options. Well, my kit bag consists of the camera and three lenses. I have the 17-40 L, the 70-200 L and the gap between them is filled by a 50mm f1.4. I’ve got a nice collection of Lee filters (NDs, ND grads and polarizer). Recently I’ve been doing a bit of experimenting with focus bracketing and stacking. There are a couple of reasons for this. One is to keep the aperture in the sweet spot to limit diffraction, and the other is to be able to blend shallow depth of field exposures to drop areas out of focus in post processing. It’s a bit crude, but there have been a few occasions where I’ve wished I had camera movements. I’ve had mixed results as it’s still for me in the experimental phase. Obviously having a small sensor limits print size, so I’ve been doing a fair bit of stitching. I’ve been quite happy with the results too. I started by just making more traditional 6x17 style panoramic images. Lately I’ve made a few 4:3 crops of details, which have worked surprisingly well. I want to get the best quality images I can out of the equipment I own, which has meant adapting a little bit to maximize the results. I have Lightroom and Canon’s own Digital Photo Professional. I hardly use them to be honest – just for lowering contrast as much as I can to give me a nice flat Tiff image to start with in Photoshop. I’ve used Photoshop for years. I was using it for design long before I started making photographs. It’s my main tool I work with during the day, and then I come home and do it all over again with my own images! My workflow in Photoshop usually consists of adjusting the shadows/highlights, colour balance and contrast using curves. Woodland images can be very busy, so I often vignette the edges and perhaps accentuate any lead-in lines by lightening or darkening them slightly. I find it helps to keep the focus of the image where I want it to be and cut down on any visual distractions. Well when I picked up those few shifts at The Times, I had a casual interest in photography. The full obsession hadn’t kicked in yet. I just needed to pay a few bills while continuing looking for a ‘proper job’. I soon learnt I was in the company of some of the best photojournalists in the country, and began to soak up their work and knowledge. I owe more to those guys than I do to any traditional landscape photographer. I’m still in awe of what they do and how hard they work. Especially those who regularly put their own lives in danger in war stricken counties. I mean, I admire the work Ansel Adams as much as anyone, and one day I might produce a photograph that’s as good as one of his, but I’m never going to stick myself in the firing line in Afghanistan. David Bebber’s work stood out in particular for me at the time (www.davidbebber.com). You may be familiar with his portrait of Colonel Gaddafi which won the British Press Photographers Association picture of the year a couple of years ago. Andrew Testa’s (to be neutral, he does not work for The Times) work is incredible as well, especially the images he shot in Kosovo in the 90’s. (www.andrewtesta.co.uk) You have to remember it’s all on film, in the heat of the moment. I tried doing live band photography, which seemed obvious as I went to a lot of gigs. I then had a brief stint at underwater photography. The results were dire, but it provided the link between the live work and nature/landscapes. Underwater photographer David Doubilet’s book ‘Water, Light, Time’ is one of my favourite photography books (www.daviddoubilet.com). It’s worth it for the cover image alone, and there are some very good seascapes. It’s an area of photography I’d like to try again one day. As far as landscape work goes, over the last two years I’ve been really interested in Dav Thomas’ work and yours too Tim. Eliot Porter and Peter Dombrovskis are two names from bygone years whose work really stands out. I really struggled with woodland photography to begin with. It separates the men from the boys in some respects. I can’t see myself going back to photograph a rock on the beach at sunset for sometime. There’s been some discussion in this publication regarding the parallels between music and photography. I couldn’t agree more, and this image for me is proof of that. Despite to most people’s ear, the style of music I play is a bloody racket, it’s actually very complex. The arrangements in the last band I was in had up to forty riffs in a song, stretching over seven or eight minutes. Just like woodland photography, attention to detail and composition is paramount. I was almost an hour deliberating how to best resolve this scene. By far the longest amount of time I’ve spent on an image. The rain-drops on the branches in the top left, the tree on the far bank on the grass, the twigs overlapping the water at the very bottom of the screen to contain energy. These were all deliberate decisions. The elbow of the branch touching the right hand side is in fact two branches: one heading straight out of the frame and another coming in from a tree just out of shot. It was also made at 2 o’clock in the afternoon. Beautiful warm sunsets are over-rated. This is the opposite of the first image. I went for a walk and this happened. It’s cropped from a three frame horizontal stitch. The light on the trees lasted just long enough to get the three frames off. If I’d stopped to set up a portrait stitch I would have missed it. 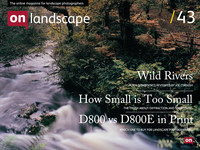 This currently sits in my LPOTY 2012 reject pile, which I’m pretty disappointed about. I wanted my last choice to be from a different location, but for some reason kept coming back to this. It’s my ode to Joe’s ‘Sky Cascade’ from Scotland’s Mountains. It’s about as dynamic as Epping Forest gets. Somewhere in there is my Lee Polarizer, which I managed to retrieve about thirty minutes later after much poking around with a stick! I’d like to dedicate some time to writing music again. I’m not sure if I’d go back to playing in bands though. I can play guitar, and just about get by on drums and keyboard. A one-man home-studio project would be ideal. I’d also like to get involved with conservation somehow. More specifically protecting our seas and the endangered species within them. We treat the ocean both like a dustbin and an endless source of food for our gluttony. Over-fishing, pollution and the feeling that human beings have the right to destroy four and half billion years of evolution to satisfy our greed makes me mad. It’s making my blood boil just thinking about it. I toyed with the idea that the Epping project should be a year on digital and a year on film, but decided against it. I may still have a crack at film again though. When the project is over I want to do something completely different. I’m getting itchy feet and want to go back to travelling further afield, perhaps Scotland. I’ve only been once for a photographic trip. Honestly, I don’t know how Andrew Nadolski and Mike Jackson lasted so long on their respective beaches. I’d really like to see Ian Cameron and Bruce Percy be part of an edition one day. From Flickr I really like Paul Morton (no relation) and Matt Toynbee. Any of those guys would do me.